Duration: 3 nights / 4 days package. Rates include all activities and services as per itinerary, English speaking tour guides (other languages available on demand) as well as accommodation and meals. 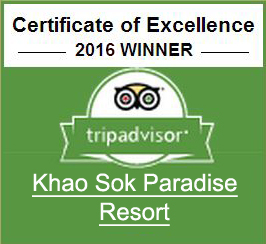 Rate do not include all beverages, the Khao Sok National Park entry fees and any service or activity not mentioned in the chosen package. Our staff will meet you directly at the Resort at your convenience. Lunch, check into your room in your room decorated with tropical flowers, delicious bottle of wine and seasonal fruits. Enjoy a two hours Thai traditional or oil massage followed by a candle light Thai dinner on your balcony or in one of our private salas. Overnight in your jungle accommodation. Breakfast, followed by an unforgettable elephant experience at a dedicated elephant sanctuary run by committed conservationists. Here you will have the chance to hand feed, give a mud spa treatment and bathe these gentle giants of the forest. Lunch, then visit the Khao Sok hot springs in the evening. Dinner and overnight stay in your luxurious jungle accommodation. Breakfast then transfer to the Chiew Larn lake, the boat journey to the raft house takes about one hour, on our way we will stop at the Guilin rock formation which is one of the best spots to observe wildlife relax by kayaking for a while, lunch followed by a jungle educational trek, explore the Namtaloo or coral cave after what we will take you for a long tail cruise around the lake and then transfer you back to the Resort. Dinner and overnight in your jungle accommodation. Breakfast, end of our services and transfer to your next destination (not included in the package).